During this day, Suara Pulau and partners will be deploying a new structure underwater. Step out of your daily routine. The chance to shake hands with your fellow travellers. People on a mission who take nothing for granted. A four day festival to explore how technology can be a powerful instrument for positive change. On June 15th, CoralGardening will participate in the Coral Reef Engineering Lab, where two of our questions will be presented to all kinds of experts in order to find a solution together. Do you want to use your creativity to restore coral reefs? Come and join us. The third Trash Hero Thailand Family Meeting, will be held in Bangkok from 27 – 29 April. 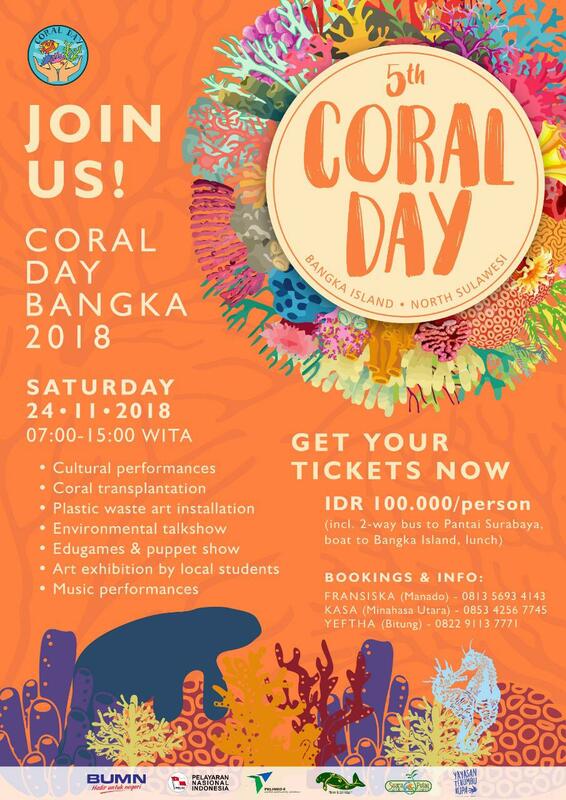 We give a presentation about coral and plastic soup on Sunday. Once a year our community comes together to celebrate Save Koh Tao festival. This year CoralGardening will be present with a booth and workshops for young and not so young ocean lovers. Find us next to the water station close to the main bar, where you get a free refill if you bring or buy your own stainless steel bottle. We will have a booth and two workshops. You can create your own artificial reef or paint fishes with your hands on our wall of waves. Come enjoy the beautiful decoration, live music and many activities at the free Save Koh Tao festival, in the coconut field North from Sairee. This Year’s Festival will be BYOB – Bring Your Own Bottle…Not Beer (that can be purchased at the festival, so don’t panic). Duikvaker will be held for the 26th time on 3 and 4 February 2018. This dive event for divers, freedivers and snorkelers has opened the diving season for over 25 years. It will be a lively weekend with more than 100 stands, over 80 speakers and a lot of visitors. There is something for every diver, freediver and snorkeler, from presentations in the seminar areas and at the stands, to a complete range of diving, freediving and snorkelling equipment, and diving holidays to training. A great day of adventure for the whole family. Make a real dive, or dive with dolphins in the VR space. Discover how seaweed grows and tastes and see how important the ocean is for all people and animals on the land. During this day two flowers will be planted, for more information see our Facebook page. During this day a flower is planted again. Aqua Tao instructors will have their first Eco presentation. CoralGardening crew Thailand will tell them about the construction of the CoralGarden and invite them to join! We will also challenge the young women and men to take an extra step in reducing their plastic usage on Koh Tao. Come join us at the rooftop bar of Canopia from 7 pm! 16 March 2017 – Huge clean-up day on Koh Tao! Join the nearest beach and reef clean-up today! Beach clean-ups will start at 9am and make sure you sign up for a reef clean-up at the nearest dive centre before 11am. Come to the pier at 4:45pm to weigh the amount of waste we have collected and for a group photo. Follow us on Facebook for the details. Tonight we give a presentation to dive team Thalassa Amersfoort in Soest. Be there! One morning with lectures to various diveschools and the International School QSI from China. And creating the leafs of the flower with a team of volunteers. This weekend CoralGardening is present with a huge stand on the biggest dive exhibition Duikvaker. This year we have an extra table for the famous workshop CoralGardening for kids. Join our lectures, info-snacking and many interactive ways to learn about coral and what we can do to protect and restore them. Subscribe now for our updates and win a ticket to Duikvaker 2017! See you at our info booth in Expo in Houten, near Utrecht. On invitation by diveclub Narwal from Almere for a lecture for their members and all (non-members) interested in Almere to join this evening in the swimming pool in Almere. This afternoon we will give lessons about our ocean, what coral is and how we all can help to protect and restore the coral reefs. What can we do to protect sharks and corals. Express your ideas in a sand castle on the beach of Khao Lak. Today is EcoDay! One morning with lectures to various diveschools and creating the last leafs of the flower with a team of volunteers on the Save Koh Tao workplace. A team from diveschool Kev-Mic Diving Alkmaar joins us to create a few bases for new flowers. They promised to bring us equipment as well. We look forward to equip you with their sponsored materials! A few days follwing the lecture we welcomed the team of new freedive professionals on the workplace to create the first flower of the CoralGarden. The enthusiastic team of Blue Immersion invited us for a lecture for their Masters in training. Today you are welcome to join our workshop CoralGardening. If you are not related to any of the participating organisations or missed our previous workshops, you are welcome to join on this open workshop. For free ofcourse! Today is EcoDay! One morning with lectures to various diveschools and creating a flower with a team of volunteers on the Save Koh Tao workplace. Join the beach clean-up in Mae Haad from 9 – 11 am. 28 September 2016 – Double Diving Film night in Omniversum The Hague. This evening we will be present at to inform you about coral reefs and what we do to preserve and protect them. You will enjoy two astonishing IMAX-films. Of course also about coral reefs! This EcoDay we give a presentation that is more in depth on how we aim to restore coral reefs and how a CoralGarden is being built. Join us on the workplace this EcoDay afternoon to learn how to weld and get your hands dirty with concrete. This EcoDay we give a presentation for several diveschools on Koh Tao. In the afternoon we will give the CoralGardening workshop for a group of volunteers where we will create the first flower of the CoralGarden. 19 juni 2016 – Opening of photo exhibition of dive Narwal, Almere. Duikvereniging Narwal opens their photo exhibition about underwater life in the Almere library. CoralGardening is there to talk about coral reefs. Also chance to say farewell to Frank and Vera. Buy tickets here. Ticket sale closes on March 24th. April 4 – Opening of the new and most astonishing office of Olympia in Bergen op Zoom. Februari 13 – Presentation between two boat dives at Tertius in Zeeland. Of course CoralGardening is present at Duikvaker, the largest gathering of divers in the Netherlands. CoralGardening has a stand, will give a presentation and hold workshops in CoralGardening. The largest conference for water sports enthusiasts in the world. While we do not have a stand, we will be around in the weekends.